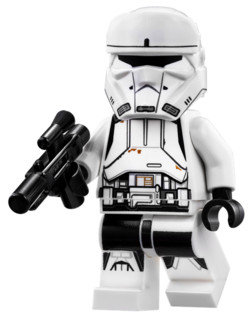 An Imperial Hovertank Pilot is a Star Wars minifigure released in 2016. Imperial Hovertank Pilots were Imperial Combat Drivers who specialised in piloting TX-225 GAVw "Occupier" combat assault tanks. Hovertank Pilots were deployed on Jedha days before the destruction of the first Death Star. At least one tank driven by Hovertank Pilots was destroyed at Tythoni Square in Jedha City by Saw Gerrera's Partisans while attempting to transport Kyber Crystals. Facts about "Imperial Hovertank Pilot"
This page was last edited on 11 March 2017, at 04:58.